This site is dedicated to Lee Tergesen and to helping fellow fans satisfy their curiosity about this terrific actor. I "discovered" Lee sometime around November of 2003. Admittedly, that was a little late in the game. "Oz" had officially ended, but it was still being re-run on HBO. With his performance as Tobias Beecher, Lee compelled me to keep watching a series I ordinarily wouldn't have watched. Too violent, mostly. But his was the character and the storyline that hooked me. There's something magnetic about him. And I wanted to see what else he's done. That curiosity has led me into great friendships, a chance to meet Lee and a growing video and DVD library. LeeTergesen.com originally was set up around the year 2000. It was an American-Canadian joint venture between three fans: Andrea, William and Bekka. They stated on the home page: "It was undertaken strictly out of admiration for Lee, and also for his fans to have a place to share in their appreciation of his work." In that statement, it's clear that although the ownership of the site has changed over the years, the purpose has not! In August 2001, LeeTergesen.net was launched by Dori, and the site became the official site in March 2002. Dori, with assistance from Anne, acquired the LeeTergesen.com domain in an auction in February 2004. In 2005, I launched The Annotated Lee Tergesen site, which had the domain name of LeeTergesen.info. My aim was not to duplicate efforts already on the Web, but to supplement and organize pieces of information from many sources. I had been acquiring all of Lee's movies and TV shows, and wanted to share even more information and detail. In April 2010, Dori entrusted me with the keeping of the official site. Both Anne and Dori have been invaluable resources to me, and I thank them heartily. The site remains a labor of love and exists as a way to help fans appreciate the work of this talented actor. I hope you find it useful and entertaining! 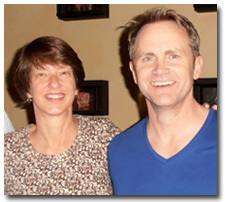 Contact me, Diane, at diane@leetergesen.com. as The Annotated Lee Tergesen Site. It became The Official Lee Tergesen Site on April 3, 2010. + Visit the Lee Credits page to launch you to the heart of this site. Not just a list, but an annotated, illustrated look at Lee's career. + Most of the individual movies and shows have been filled in to varying degrees. A few need screen caps added or the write-up expanded. + Express Thumbnail Creator, which I discovered in June 2005, has enabled the creation of bigger and better galleries. I am working on re-doing some of the galleries done previously. + Oz is a work in progress. I have uploaded screen captures for all seasons. Improved summaries will come along eventually. It's a big job! Each page includes screen-capped images from the particular show or movie described. The quality and size or the screen caps vary because the source material varies -- from crisp, commercially made DVDs to blurry VHS tapes that have been recorded a few times. I'll try to upgrade the fuzzy images whenever possible. Several Lee Tergesen fans walked in the Susan G. Komen Race for the Cure on Sept. 25, 2005, in memory of Lee's mother, who died of breast cancer in 1989. Dozens more supporters sponsored Team Tergesen, raising more than $2,500 for breast cancer research.